Take I-80 West to Exit 53 (Route 23 North). Follow Route 23 North for 4 miles on the right. Exit 153B for Route 3 / to Route 46 West to Route 23 North. Travel on Route 23 North for 4 miles on the right. 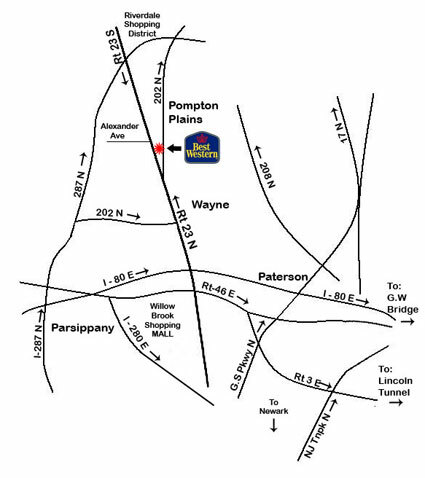 Follow Washington Bridge sign and take Exit 16-W to Route 3 West to Route 46 West to Route 23 North for 3-4 miles. Exit 52A Wayne, Route 23 South. for 3 miles hotel is on the left, make 1st U-turn. Follow I-287 South (New Jersey). Follow direction from I-287 above. Exit 53 to Route 23 North for 4 miles on the right. Option #1 - Exit to I-287 North -follow directions from I-287 (above). Option #2 - Exit 54 Minnisink Road (Little Falls). Turn left at stop sign, go over I-80, and take 1st left and 1st left again (I-80 West) to the first exit # 53 to Route 23 North for 4 miles on the right.